PAUL MITCHELL Deco-Fabulous Christmas Gift Set GIVEAWAY!! Closed!! The WINNER of the giveaway is Hareem (iheartmexoxo)! Congratulations! Please email me with your choice and your contact details! Thanks for all your entries! Stay tuned for a New Year Giveaway!!! Hi Ladies (and Gents! ), the giveaway has been extended for an extra week! 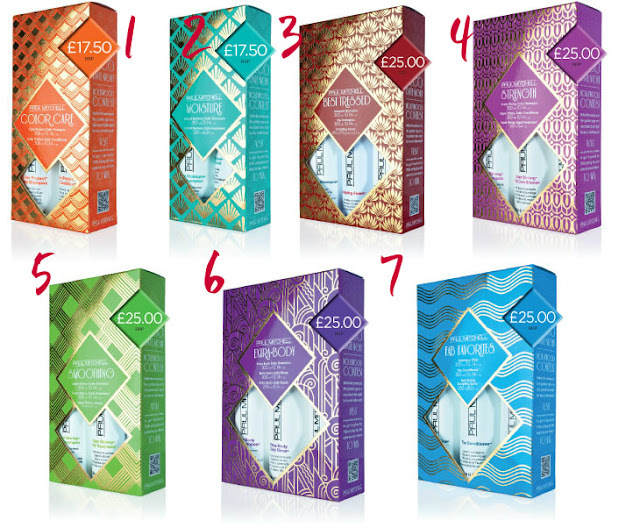 Paul Mitchell recently launched their gorgeous Christmas Deco-Fabulous gift sets. This is definitely a great gift idea for a friend or family member! There are a number of sets that are targeted for different hair types and styles you may be after. You can read more about the products on their website. Click here. So what better way to celebrate Christmas than to win one of these lovely sets of your own! Paul Mitchell have kindly offered one of my readers the opportunity to choose one of the gift sets below. This giveaway is an International giveaway. If you are under 18, please get permission from your guardian before you apply, as I will need your address details if you win. Once you have entered, please leave your email address and gift choice in a comment below so that I can contact you if you are successful! If you follow via GFC, please also leave your GFC name in the comment below. The Strength Gift Set is the one I like best. Thanks for the chance! I'd pick the Strength gift set, my hair needs it haha! I'd love to win the strength gift set. These sets look lovely, I haven't tried anything from Paul Mitchell before but I have heard good things! I'd love to try either the Strength or Extra Body set. Think I need the strength gift set haha, my poor hair is taking a beating in this weather! Amazing giveaway, thank you Victoria and thank you Paul Mitchell! I would love to win the extra body gift set! Smoothing Gift Set Love that one! The best tressed and smoothing set look lovely! Wow! Great giveaway :) I would love the #2 set because my hair and scalp are SO dry! I love the sound of the 6. Extra-Body Gift Set, it's just what my hair needs! I came here from Twitter and I was so glad to read this is an international giveaway! Since I just dyed my hair, I'd love to win the Color Care set! I would love to try the Strength Gift Set.. If I get lucky, I would love to win the Smoothing Gift Set. Extra body or colour care! The Moisture set. Thanks for the opportunity! My Favorite Set is FThe Fab Favourites Gift Set! Extra Body! My hair is so fine! Great giveaway! Would love to win the Strength gift set! The Extra Body Gift set would be my favorite!